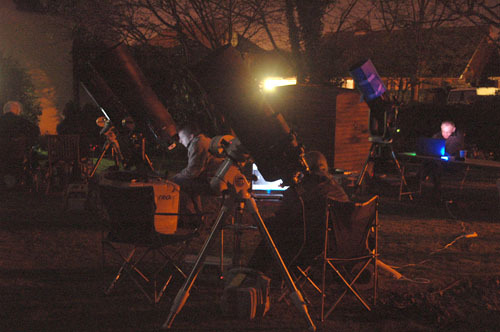 The International Year of Astronomy in 2009 marks two monumental events in the history of our wonderful hobby. The first being the 400th anniversary of the first use of a telescope for astronomical purposes, by Thomas Harriot and perhaps, more notably, Galileo. The second being the commemoration of the 40th anniversary of the Apollo 11 landing on the Moon. With this in mind, an ambitious plan by a group of British based amateur astronomers was devised to create the largest lunar mosaic image ever taken by ground-based telescopes. Using nothing more than off-the-shelf amateur equipment, the team, comprising of some of the worlds foremost lunar and planetary imagers, first started discussions on the logistics for this plan in February 2009. Various ideas were discussed, including focal lengths, equipment, and location for the attempt. A plan was settled on, to use a range of 9.25� to 14� Schmidt-Cassegrain telescopes, working at between 5.5 and 7.8 metre focal length, combined with high frame rate planetary imaging cameras, to create this truly momentous image. The 9-day old Moon was ideally placed for the attempt during the first week in April, coinciding with the IYA Spring Moonwatch. Discussions showed that it could be divided into around 8 unique segments. One segment would then be assigned to each of the team members, with an approximate overlap of 20-30% for each sector, to ensure that the entire area was fully covered. Two additional team members would then attempt to image the entire Moon at between 2.3 and 3.0 metre focal length, to ensure that if any small gaps were missed, these areas could be filled in using the lower resolution data. Sir Patrick Moore had been instrumental in mapping the Moon for both the Russian and American space efforts, during the Apollo era in the early to mid 1960s. The team requested that the attempt be made from his grounds in Selsey, further adding to the excitement being generated for this audacious plan. Sir Patrick generously accepted, and was hugely supportive of the project from the outset. Nick Howes, a freelance writer for Astronomy Now magazine, had devised the plan during the late summer of 2008, while imaging the Sun. At that time, Nick, and Pete Lawrence of Sky at Night Magazine and television show fame, were both involved in high resolution solar imaging in hydrogen-alpha, and both had created gigantic mosaics of between 60 and 127 individual panes of the solar surface. Realising that the Moon would in some ways be easier, due to its less dynamic surface, but in many other ways more difficult, due to the imaging scale required, Nick set about discussing the idea with Pete and initially some other notable lunar/planetary and solar imagers, specifically Bruce Kingsley, Damian Peach and Dave Tyler. They all seemed keen on the idea, but agreed it would be a difficult proposition, which is probably why nobody had ever attempted something on this scale before. All team members then suggested additional people to complete this historic line up. The original idea of imaging at f/40 focal ratios was quickly disregarded, as the scale and seeing issues which plague the UK could easily make the attempt impossible. At a more realistic f/25, it was calculated that just under 500 separate panes, with suitable overlap, could create the mosaic of the 9-day old Moon. With 8 team members working at this focal length, it would be achievable in a matter of hours, if the weather permitted. 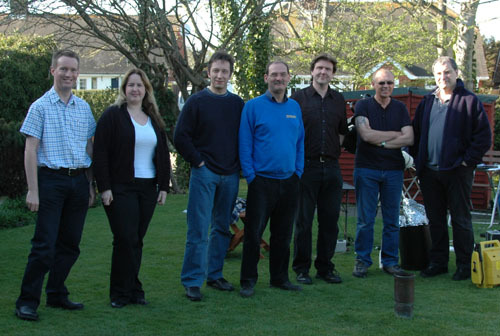 The final team, after much discussion, comprised Nick Howes, Pete Lawrence, Damian Peach, Bruce Kingsley, David Mason, Dave Tyler, Nick Smith, Trevor Little, Mark and Lea Irving, with on-site technical support by Ninian Boyle. In February, once the plan was agreed, Guinness World Records were contacted, and a claim for the attempt lodged on their website. Guinness took several weeks to research our proposal, before replying that the record attempt was valid, and our criteria would satisfy the record book entry. They also indicated that not only would it be the largest mosaic image of its type taken by amateurs, but would also eclipse any taken by a ground-based professional observatory. Each team member agreed to donate their time for free, with proceeds from any use or sale of the final image being donated to Sir Patrick's preferred charity; the Cystic Fibrosis Trust. The scene was set for an attempt on April 4th 2009. All of the participants working at high focal lengths used Celestron C11's or C14's, being popular scopes for many planetary imagers around the world. It was decided by many of the team to use Televue 2.5x Powermates or similar, to help maintain the highest quality optical path, whilst also providing the desired f/25 focal ratio with the C11's. For the high focal length, all team members used Lumenera CCD cameras (SKYnyx 2-0 and Infinity 2-1 series) with a red filter which included IR block coating. Capture software was either Lucam recorder or Norpix Streampix. For the f/10 team, the Imaging Source DMK series cameras were used, with David Mason using a 12" Meade LX200, and Mark & Lea Irving again using a Celestron (C9.25). 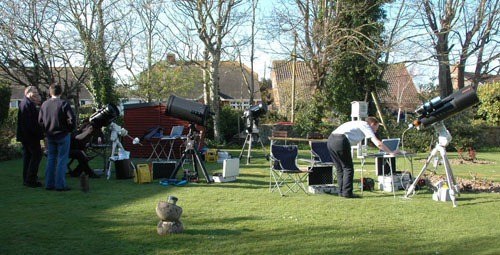 Various mounts were used, including an AP1200 QMD, Losmandy G11, Celestron CI 700, and several Skywatcher EQ6 mounts, all polar aligned and set to track the Moon. The 4th April was a Saturday evening, thus not clashing with team work commitments, and the 9.2-day old Moon was nice and high at over 50 degrees altitude. Many of the participants had previously done large lunar mosaics, but none at this high a magnification or to this size and scale. Each team member has provided a personal insight into the day's events, and how they managed their imaging setup. Click here to read them.